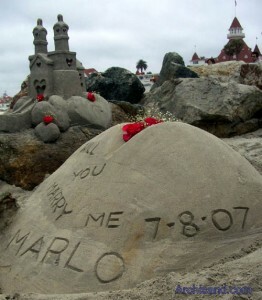 Engagement & Wedding Sand Sculptures – Archisand Professional Sand Sculptors, Inc.
A big ‘yes’ is the typical result. If you’re feeling inspired, you can provide your own design. 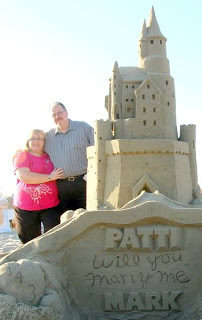 Or if you prefer, our sand castle artists will do the designing. Either way, enchantment will happen. As always, we go to great lengths to cover all the details. Beautifully inscribed into all of our engagement and wedding sand sculptures are the name of the bride and groom, the engagement/ wedding date, and, of course, the all-important question. Archisand offers professional photography services as well as custom video services to capture the surprise of the moment and make the very special occasion last forever and ever. These images are ideal for wedding invites and save-the-day announcements. Archisand also creates stunning wedding sand sculptures to add a special touch to the big day itself. Parents looking for a unique engagement or wedding gift need look no further than Archisand’s enchanting engagement and wedding sculptures to capture the joy of the day. You can make the special day live forever. Contact our dedicated sand sculptor team. They’re ready to help you create lasting memories. We Hope You Enjoyed Your Custom Engagement Sand Castle!